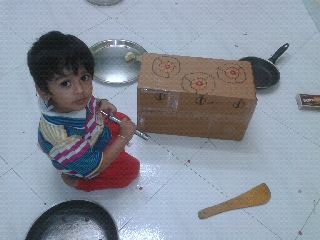 Aarav finally got fed up of me sharing his kitchen burner and utensils. So he decided to get his own three burner stove..
- It has a never ending supply of gas inbuilt. - All three burners work on telepathic control. - And its at Aarav's height. - Easy relocation all over the apartment. Aarav can even make us a snack sitting in the balcony. 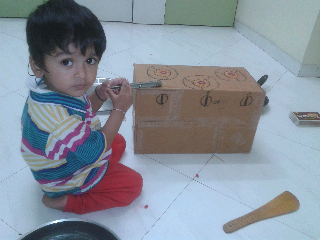 Aarav is still letting me share the utensils though. Till he gets his own.